My name is Sue Hayes. I own and run the Riverside Natural Health Centre, and I also promote NewGen Superfoods. Having worked in the complementary health business for over 15 years. I first trained and qualified as a clinical hypnotherapist and built a thriving practice for 10 years. Then an opportunity presented itself and I opened the Riverside Natural Health Centre. I believe in treating people with respect and dignity. This is the principal philosophy of which the Riverside is built on. We also strive to provide excellent customer service and backup support as well as holistic treatments by knowledgeable therapists. For a long time, I have seen and tried many health products, including Superfoods. Many promising that their product does not contain anything but the finest ingredients with no added sugars and sweeteners. With so many health products to choose from, it very confusing. The NewGen Superfoods are different and they have scientific evidence to back it up. It is almost 12 times more effective than its closest competitor, when comparing the same lab test. The NewGen product was deemed impossible to create but with some of the best minds in the industry, the finest technology and facilities. NewGen Direct has created a product that works on the whole body like no other product. How Has NewGen Helped Me? My body is under constant stress. Running a business, an elderly mum with dementia and a husband with chronic illness all takes its toll. I’m lucky that I can call upon the treatments at the Riverside to help keep my stress levels in check. Although I eat healthy food, I felt I needed some extra supplements that would provide added benefit and provide extra support to help keep my body strong and healthy. Within a few days of taking NewGen my tiredness disappeared, my energy levels began to improve and my mind became sharper. Is this product too good to be true? I’m not sure but as long as I’m feeling the benefits from it I will continue taking my daily recommended amount. NewGen is one of a small percentage of products in the world which has been tested for its antioxidant effects against a spectrum of the main types of free radicals which are known to cause the most damage and degeneration. It contains over 70 trace plant minerals, over 10 billion dairy-free freeze dried probiotics, a very large selection of certified organic raw freeze-dried superfood wholefoods, including fruits, veggies, greens, grasses, sprouts, protein, fibre and more. It contains the most effective prebiotics, digestive enzymes to aid optimal assimilation and standardized antioxidant extracts. One scoop a day mixed with a liquid of your choice can provide you with the nutrients and supplements that can help your mind and body stay healthier. How Much Do Superfoods Cost? Superfoods are not expensive. For less than a cup of coffee a day, you can provide your body with the minerals and nutrients that your body needs. 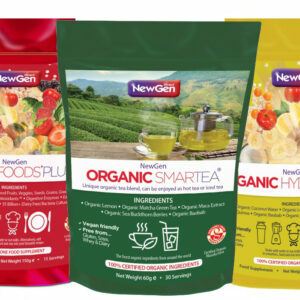 How Can I Purchase NewGen Superfoods? You can purchase Superfoods and read about NewGen products and the benefits of Superfoods by visiting the Riverside Natural Health Centre website NewGen. I have a question about the product? We are here to answer your questions. Contact Us at the Riverside.